Fifteen students, four teachers, one herder and three Annapurna Conservation Area Project (ACAP) staff joined two SLC coordinators on a one-day field excursion to Sakawo, a snow leopard hotspot in high alpine pasture with abundant snow leopard signs. Here they learned to observe and classify blue sheep as well as identify and characterize snow leopard signs and habitat. Training was also given on remote camera installation and monitoring. The excursion concluded with environmental games, debates, and information exchange with Conservation Area Management Committee members. 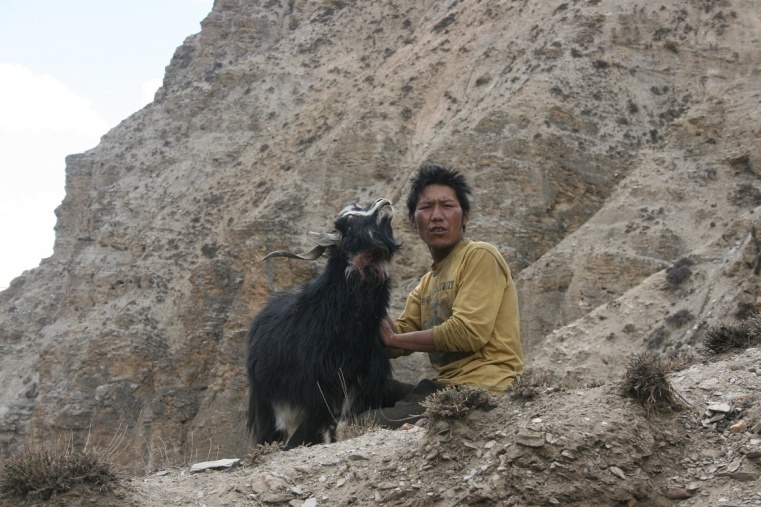 In Upper Mustang snow leopard habitat Bikram Shrestha and Pema Tshering coordinated local herders and students to install five camera traps at sites in different sites in Samdzong, Sakawo (Lomanthang) and Marang. In 2012, one female snow leopard with two cubs were captured in Sawawo, while the camera in Samdzong also captured one image (although barely clear). It was interesting to note the interest and enthusiasm among students to monitor the female with cubs in Sakawo. SLC-Nepal program will help students achieve the snow leopard monitoring for years.